We made sugar free, wholemeal pancakes! They were delicious! Come and join us for a morning of fun filled activites in class 1 and nursery. 2nd Wednesday of every half term! As part of our toys topic and Children in Need Day Class1 and 2 brought their teddies to school. 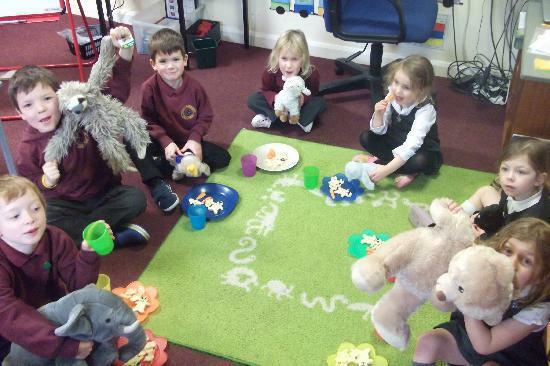 In Class 1 we had a fun day writing fact files about our teddies, measuring them, making biscuits, learning new teddy songs and games and finally enjoying a teddy bears' picnic. We went to Keswick museum last week to take part in a fossil workshop. We learned about different types of stone and how fossils are formed. We had a look around the museum, identified different materials and made toothpaste! We also had a play in the park which was highly educational!! The children are having fun and imporving skills on balance bikes. 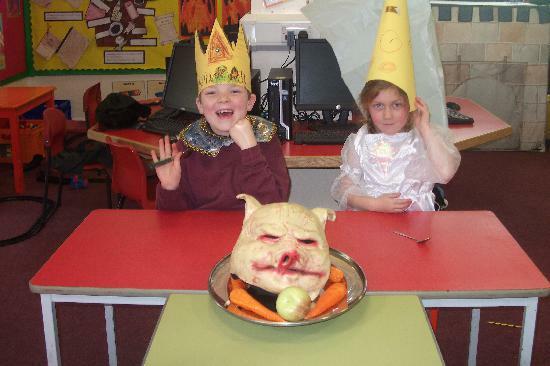 As part of their 'Kings and Queens' topic, Class One had a medieval banquet. All the class dressed up as kings, queens and knights and ate lots of delicious food. 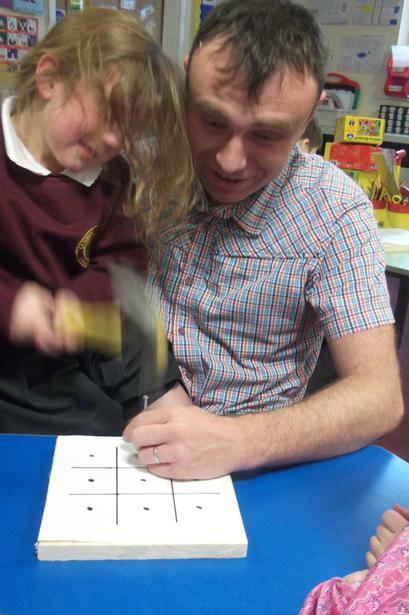 Alister Renton has spent an afternoon with Class 1 making traditional noughts and crosses boards with the children. They enjoyed using woodworking tools and painting thier finished pieces. They were particularly captivated by Alister's 'dryomatic' machine which he had invented for the purpose of making the boards! The children were excited to take them home to play with at the end of the day. Class 1 had a lovely visit to Maryport Aquarium as part of our Seaside topic. We found out about a variety of sea creatures but particularly enjoyed stroking the rays. Some brave children even held a starfish!